BASEC offers a number of management system certifications to eligible manufacturers, distributors and others in the cable sector. Click on the expanding articles below for more information. This specification is based on the requirements of ISO 9001, with additional specific requirements for cable, and for the BASEC marking scheme. Certification to ISO 9001 is offered at the same time. Only manufacturers of cable and related products are eligible to hold PCR certification. Once PCR certification is held, and specified type testing of products is complete, a License to use the BASEC Mark can be issued. The route to BASEC PCR certification is set out in the PDF document. It involves a two-stage initial assessment process, regular surveillance audits combined with sample selection, and three-year validity before recertification. BASEC is able to audit integrated or stand alone management systems, if certification of ISO 9001 and/or ISO 14001 and/or ISO 45001 is held. BASEC requires clients to upgrade their certifications to the latest edition of the BASEC PCR in line with BASEC's requirements and published timescales. Factory Production Control Certification for the Construction Products Regulation (CPR) BASEC offers certification of manufacturers' factory production control systems for the purposes of Construction Products Regulation assessment activities. If clients already hold BASEC PCR certification or ISO 9001 certification the audit processes may be combined, saving cost. The route to BASEC certification of FPC is set out in the PDF document. It can involve a two-stage initial assessment process, twice-yearly or more frequent surveillance audits, and three-year validity before recertification. BASEC requires clients to upgrade their certifications to the latest FPC requirements in line with CPR requirements and timescales. BASEC offers certification to ISO 9001 to cable manufacturers, distributors and others in the cable sector. 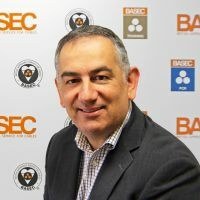 The service is offered either as a separate certification or as a supplement to BASEC PCR certification (for manufacturers aiming to hold a BASEC Mark license). The route to BASEC certification of ISO 9001 is set out in the PDF document. It involves a two-stage initial assessment process, annual or more frequent surveillance audits, and three-year validity before recertification. BASEC is able to audit integrated or stand alone management systems, if certification of ISO 14001 and/or OHSAS 18001 is held. BASEC requires clients to upgrade their certifications to the latest edition of ISO 9001 in line with accreditation requirements and timescales. BASEC offers certification to ISO 14001 to cable manufacturers, distributors and others in the cable sector. The service is offered separately from BASEC PCR certification and product marking. The route to BASEC certification of ISO 14001 is set out in the PDF document. It involves a two-stage initial assessment process, annual or more frequent surveillance audits, and three-year validity before recertification. BASEC is able to audit integrated or stand alone management systems, if certification of ISO 9001 and/or OHSAS 18001 is held. BASEC requires clients to upgrade their certifications to the latest edition of ISO 14001 in line with accreditation requirements and timescales. Once ISO 45001 is published, replacing OHSAS 18001, certification will be offered to the new standard and existing clients holding OHSAS 18001 will be transferred to the new standard. BASEC requires clients to upgrade their certifications to the latest edition of the applicable standard in line with accreditation requirements and timescales. Manufacturers interested in obtaining BASEC certification of their Health and Safety Management System should contact the BASEC offices.